Peru is a land of extremes - from lush, towering Andean peaks to rolling sand dunes on the Peruvian coast, to the largest, most diverse rainforest in the world, the Amazon rainforest. Peru is also rich in pre-Colombian culture with millions of citizens in the Andes Mountains who still live, speak and work the way their ancestors did thousands of years ago. Discover the must-see sites of Magical Peru! Extend your Adventure with these Add-ons! The highlights of Southamerica in one Amazing Trip! Cusco, The Sacred Valley, Machu Picchu, and the Inca Trail offer a glimpse into the mysterious and fascinating history of the Incas. Many other lesser known but equally breathtaking trekking opportunites and cultural experiences await in Peru's Sacred Valley. Lake Titicaca is the world's highest navigable lake spanning from Peru to the border of Bolivia with over 30 islands, some inhabited, with cultures dating back to the pre-Colombian era. Lima, the capital city, claims some of Peru's best museums, including one of the largest in South America. Arequipa is a stunning town located at the base of the beautiful valley of El Misti volcano. It offers a relaxed, romantic environment complete with colonial charm and rich cultural heritage. Everything within this city, from the intricate terraces and delicate gardens to the complex system of aqueducts, was designed to both promote and preserve the sacred relationship between man and nature. Natural phenomena like the sun, moon, water, and earth, were sacred to the Incas and were the inspiration for much of the city’s layout. 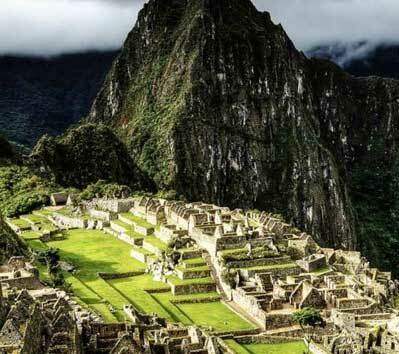 One can only reach Machu Picchu two ways: train and the Inca Trail. If hiking isn’t your style, you can grab a train from Cusco, Urubamba or Ollantaytambo. The train will take you to Machu Picchu Pueblo station (also known as Aguas Calientes) where you can then catch a bus to the ruins. 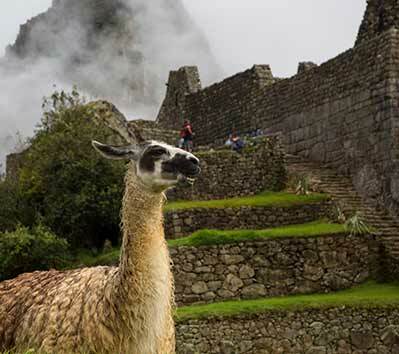 Despite the peace and tranquility conjured up by its astounding natural beauty, Machu Picchu is a fervently protected place, inhabited by numerous whistle-blowing guards who noisily herd unsuspecting travelers who have strayed from the main path. To explore the ruins in peace the best option is to hire a guide or buy a map and stick to the specified routes. One of the biggest drawing points to the city of Lima is the fact that it is home to some of Peru's best museums, notably the Museo de Oro del Peru (Peruvian Gold Museum) and the Museo de la Nacion (The National Museum), which is one of the largest museums in South America. Other highlights include colonial architecture at Iglesia de San Francisco, pre-Inca pyramids at Pachacamac, and catacombs in Central Lima. 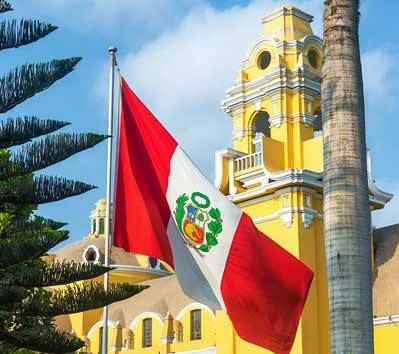 The recently renovated Plaza de Armas has been Peru’s governmental center since 1535 with the Palacio de Goberno and the Archbishop’s Palace at its center. Recently, upscale restaurants and cafes have sprung up in the area right around the plaza. The coastal suburbs of Miraflores, San Isidro and Barranco are popular places to stay to avoid Central Lima’s smog and loud chaos. Barranco is especially popular for its nightlife and performing arts center. There are a variety of hotels in Lima for every taste and budget. The Central Lima Hotels are mainly in the budget to mid-range, with a couple of more luxurious exceptions. These downtown hotels are often charming converted mansions. The Miraflores hotels are a mixed bag, with everything from youth hostels to five-star palaces. If high-end is your thing, you'll probably want to check out the San Isidro hotels, which include a variety of luxury options. Backpackers looking for hip, inexpensive youth hostels should check out the Barranco hotels, which are popular with young international travelers. If you are just using Lima as a portal to Cusco, your flight will most likely arrive late at night and leave for Cusco early in the morning. You can either tough out the layover in the airport or go to a hotel for a few hours until your flight leaves. The Miraflores district is your best bet for a reasonable rate on a room and you won’t have to travel too far. Central Lima is about half an hour to 45 minutes from the airport. 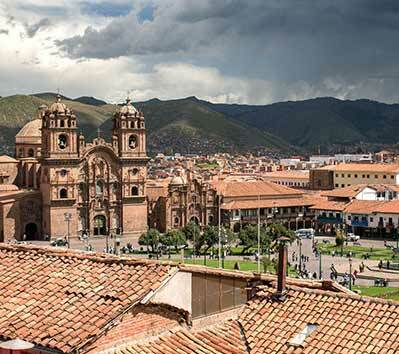 Be sure to be at the airport early as the flights to Cusco are often packed and flights are often delayed to this cloudy, mountainous city. And for those who want to stretch their legs a bit, but aren't up for a week-long adventure over mountainous terrain the nearby Inca ruins of Sacsayhuaman, Q’enqo, Puca Pucara, Tambo Machay, Tipan, and Pikillacta and Rumicolca make excellent day trips. Because the city is a popular destination along the Gringo Trail, it has a large variety of hotels and restaurants to accommodate any traveler’s tastes, from five star world class hotels to hostels the most miserly of backpackers will find affordable. 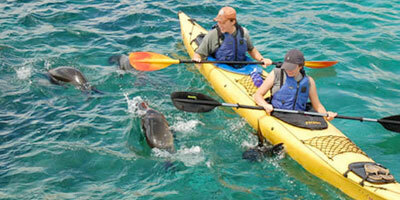 The city is extremely visitor-friendly city, with tour agencies on every block and extremely helpful locals. Most of the major Cusco activities are within walking distance of one another, and can be covered in about half a day, though you may want to devote a little more time to browse the various shops and markets you may encounter along the way. Even a short exploration around these emerald-blue waters yields unbelievable encounters with the local people, their customs, and way of life. The lake is home to a culturally diverse mix of Quecha and Aymara-speaking people who have managed to maintain the 3,000 year old traditions of their ancestors. The lake has a very unique mixture of natural and cultural beauty. In particular, the islands of Taquile and Amantani, Anapia and Yuspique, and Suasi offer visitors a unique glimpse into the lake’s shores and the people that inhabit them. The bizarre floating Islas Uros, composed of carefully constructed reeds anchored to the shallow lake bottom, are spectacular. Along the lake’s southern shores are the charming villages of Llachon, Chucuito, and Juli, where you’ll find ancient ruins, and a variety of Spanish-style churches. 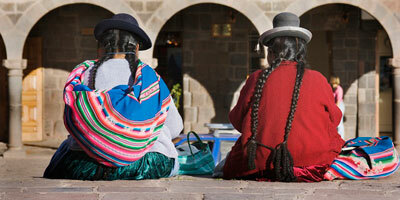 Near the southwestern corner of Lake Titicaca is the sprawling city of Puno. As the only major city located on the shores of Lake Titicaca, it is a central point of departure for other more interesting destinations, such as the cities of Lampa, and Arequipa, or the ruins of Sillustani, Pucara, and Raqchi. 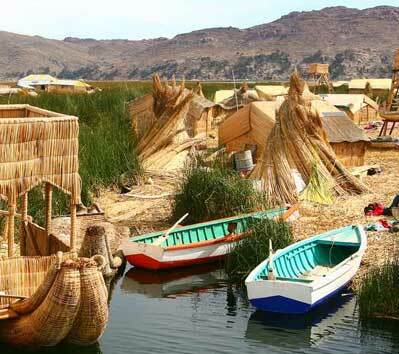 Whether you’re a culture-buff or adventure-junky, the shores of Lake Titicaca are sure to entertain and astound. You can reach the lake via a 12-hour train ride from Cusco to Puno through the Andes. The trip boasts unforgettable views of Andes scenery, including farms, waterfalls, and a patchwork of reddish-brown landscape. Beware as the train passes through Juliaca as security can lapse there when residents come aboard and lights often flicker off.